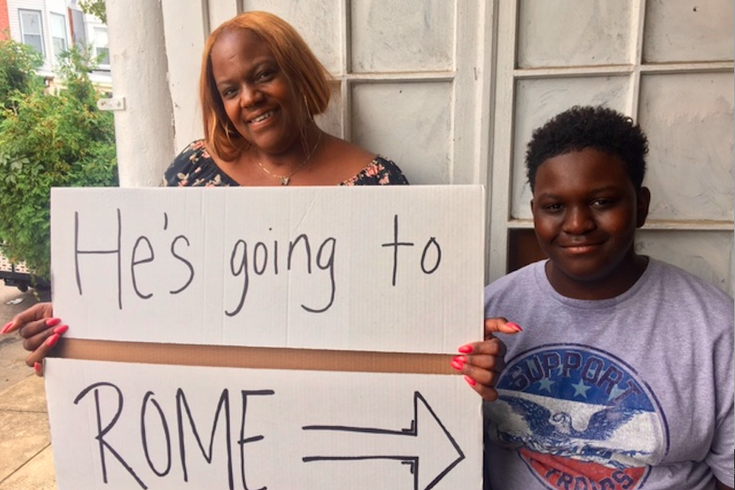 Thanks to his mother's tireless efforts, and the kindness of strangers, Mohammad 'Kareem' Bah will travel to Rome, Greece and the Vatican with classmates from Boys Latin of Philadelphia Charter in April 2018. Mohamamad “Kareem” Bah just turned 13. But that wasn’t even close to the most exciting part of the seventh grader’s past week. Most memorable was how his family's stalled effort to raise enough money to send him on a class trip to Europe became an example of social media being used for goodness and kindness. It's especially touching because it seemed like the trip would never happen. 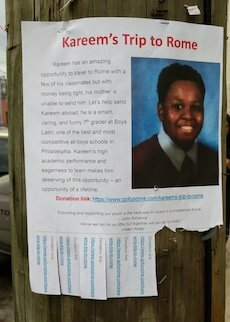 Some three months ago, his mother Tonya Crawford-Bah started posting, and handing out fliers, in their immediate Southwest Philadelphia neighborhood and beyond. Those flyers told a story: After getting just one question wrong on the National Latin Exam that students take annually, and thus beating out even the honors students in his school, the seventh grader at Boys Latin of Philadelphia Charter School scored an invite to travel to Rome, Greece and the Vatican with classmates and faculty. “Kareem’s high academic performance and eagerness to learn makes him deserving of this opportunity, an opportunity of a lifetime,” the flyers read. Kareem wanted to go so badly, but his parents just couldn't scrape together enough cash to make it happen. They needed to depend on the kindness of strangers. At 51, Crawford-Bah's admittedly not well-versed in the world of computers. Her daughter Kiana Medley is, though, and more than two months ago, they added a GoFundMe page to the fundraising effort. “For months, we’d only raised $230. We were at a standstill,” Kareem's mother explained. “Two months ago, my mother died. Two months before that, my stepfather died. Tonya admittedly felt bashful about handing out the flyers as often as she did. In the end, those dual efforts paid off. Tonya Crawford-Bah papered her neighborhood with fliers so her son Kareem could go on a class trip to Rome. Just last week, a 19-year-old Villanova University student named Jasmine Mays noticed one of those flyers somewhere along 40th Street. "For some reason his poster caught my eye. I took a picture of it and made it my business to donate to the cause," said Mays, a West Catholic alum who noted that she's a proud Gates Millennium and Villanova Presidential Scholar entering her second year studying biology on the pre-med track. She got in touch with the family and told them that the story touched her so profoundly that, to help see Kareem succeed, she posted information on her social media accounts. "I saw myself in Kareem and all of his wonderful accolades reminded me of my senior year at West Catholic where I was president of almost every club and valedictorian of the class of 2016," she said. "Kareem has something special and that is drive and determination. I know this without even meeting him." Thanks to shares on Facebook, Twitter and other sites, word spread quickly, and people opened their wallets. Mays couldn't believe it either. "Personally, I had no idea how much of an impact that I could have, but I was determined to do something because of the infinite chances that I have been blessed to receive," she said. While they’d only had $230 of the $4,500 goal before this week, the GoFundMe tally struck $5,000 on Wednesday. With that, Kareem will be able to travel to Europe next April. Suffice it to say, the Bah family is overjoyed, overwhelmed and over-appreciative of the kindness that has touched their lives and made a dream come true for a bright boy. It’s especially touching since Crawford-Bah said her son is often bullied at school because of his weight and shyness. “Oh my God, he is just so excited,” she said. “I kept telling him 'I don’t think you can go, I don’t think you can go,' but now, he can go.